Published in Aretê Journal, Fall 1970 Vol. 1 No. 2. One out of eight persons is poor in the city, but one out of four is poor in the countryside, according to the National Advisory Committee on Rural Poverty. Rural poverty means primarily farm poverty. Landless, jobless, or underemployed, the rural poor suffer from the meagerest diets, the lowest incomes, the most dilapidated housing, the worst schools, the least adequate medical care, and the most blatant racial discrimination. While the nation’s welfare and poverty administrators, with their limited resources, focus increasingly upon the problems of the cities, the rural poor are overlooked, if not forgotten. Yet, as our legislators are beginning to discern, there is a direct relationship between rural poverty and the “urban crisis,” a crisis that has resulted in large part from the migration of hundreds of thousands of families from the land to the cities during the last quarter century. These former farm laborers, homesteaders, sharecroppers, and tenant farmers who lack formal education and industrial skills, when forced off the land become victims of an urban system which has little regard for their needs, their skills, their traditions, and their dignity. This applies to Black as well as White migrants. Modern industrial enterprise is no longer capable of absorbing the large numbers of untrained immigrant laborers in the manner of fifty and seventy-five years ago. Tragically, modern agriculture has produced not simply surplus cotton and surplus wheat, but also surplus people. There are indications that this massive internal migration from rural to urban areas has begun to abate. Contrary to what is commonly believed, this movement from the country to the city was not inevitable. An agricultural policy which paid farmers not to grow cotton and neglected the massive unemployment which resulted therefrom, a policy which has favored and supported technological innovation on large and “efficient” farms, to the near neglect of small family farms, did much to accelerate the internal migration. It appears that for many poor families, it has been less the attraction of the city, than the lack of an alternative that has driven them off the land. As the cities become less and less of a desirable escape from rural poverty, millions of poor remain, as if trapped, upon the land. The rural new town idea grew out of a desire to develop an alternative to urban migration for these millions. It constitutes an attempt to develop an approach which closes its eyes neither to the need for agricultural and industrial development in rural areas, nor to the needs of the people and the welfare of the community. It is concerned with efficiency not only in economic, but even more so in human terms. Rather than seeking larger welfare benefits and expanded service programs for the rural poor, it posits a social alternative which is primarily fostered from the grassroots up, rather than from the center down. To create an economically viable alternative to urbanization for landless tenant farmers, sharecroppers, farm laborers, and poor homesteaders. To devise new methods whereby small farmers with limited resources may share in the benefits of modern farm technology and industrialization. To make improved social welfare services available to rural families on an equitable basis. To decrease rural poverty and economic dependency. To encourage decentralization and community self-government which will permit the expression of life styles which are independent of those imposed from without, or above. To reduce individual economic insecurity by eliminating land speculation, absentee land ownership, and systems of tenancy whereby the user of the land is victimized, and by devising an alternative system of beneficial land trust ownership. Innovative planners tend to approach their tasks not only with more or less explicitly stated goals, but also with generalized models of that which they wish to create. Especially for social planners this is a dangerous, but seemingly unavoidable, practice. It is dangerous because it necessitates the imputation of needs, preferences, and desires on behalf of the client system—in this case, the ultimate residents of the rural new town—on the basis of educated guesses, at best. It appears to be unavoidable because, without some preliminary ideas, there can be no planning. The work of the innovative planner, therefore, begins with a design, but this major task commences only when he grapples with the reality as perceived by his clients on the one hand, and the constraints of the environment on the other. In the practice of innovative social planning as here conceived, between the design and the reality which results, there is an all-important process—but rarely a static plan. The planners/developers of the rural new town in Southwest Georgia, that is, the members of the board of directors of New Communities, Inc., have from the beginning been committed to a planning process which assures maximum participation in decision making on the part of the potential and actual residents of the town. The original design, therefore, the “Rural New Town Idea,” has served but as a consensus base, a jumping off point, which in principle is open to change as the community develops. Several villages of 100-200 houses will be clustered around a common center where stores and services are located. Within this service core, all essential services which are required by residents on a daily basis are located, within walking distance of their homes. Several such village nuclei are, in turn, organized around a larger center within which more central services are provided. The farm land spreads out beyond the town in a wide green belt. Adjacent to, or within walking distance of each home, is a small plot of land which serves the family for its own needs, a vegetable garden, perhaps some poultry and livestock. Beyond these plots are large fields which are cooperatively farmed, using modern farm machinery and the most up-to-date, large scale farming methods. The large farming enterprise will provide employment for only a portion of the residents. Industries, commercial enterprises and services, most of which are cooperatively owned and managed, will provide additional employment. One of the major economic bases for the Rural New Town might be its function as the social, medical, recreational service hub of a larger geographic area. There is no thought that this community will become an isolated Utopia: nonresidents may well be employed within it, and its residents may, in part, commute to work elsewhere. Moreover, it is expected that industrial corporations, governmental agencies and individuals will contract with the town for the development of manufacturing, commercial, and service enterprises. For example, one of the first industries that may be developed in the Rural New Town, with the assistance of outside capital, is the building of prefabricated housing. Eventually, this industry may be expected to serve a much broader geographic area than only the Rural New Town. The Rural New Town will be established on a large tract of rural land, preferably in an area where the need, and the political basis for such an enterprise appears to exist. Its primary purpose is to serve the people of that locality, not to import residents from elsewhere. Thus, the first Rural New Town is being created upon the political basis of long-term community organization efforts in Southwest Georgia. It expects to attract primarily persons living within this area rather than hoping to lure former migrants back from the city. It is helpful to relate the Rural New Town idea to land reform efforts in other areas of the world. Such land reform programs have frequently foundered due to a uni-dimensional approach which involves land redistribution only. It has been learned from these efforts that successful land reform can be achieved only when additional capital resources are made available for agricultural credit, to facilitate the modernization of agriculture and for the elaboration of a market-oriented infrastructure. In the case of the Rural New Town, the necessary development capital will be raised partly from government, but largely from private sources, on an eleemosynary invest-ment basis. Charitable foundations, corporations, organizations, and individuals will be called upon not primarily to contribute, but to invest in the Rural New Town on a long-term, low interest basis. Such “social investments,” rather than outright grants, are gaining increasing acceptance among the directors of charitable foundations and national church organizations. The Rural New Town will also issue debentures in smaller denominations, which will be available for purchase by private individuals who wish to participate in the town’s development. Charette participants — perspective settlers and consultants discuss ideas for the Rural New Town. Of central importance to the Rural New Town is the concept of the Land Trust. Whereas residents will own their homes and the improvements which they make on their individual plots, ownership of the land will rest with the Trust, which is indirectly controlled by the residents. Residents of the Rural New Town will have full and exclusive usership rights to the land, paying only nominal user fees. They forfeit these rights only when they personally cease to use them. Usership rights may be inherited, but not sold, leased, or mortgaged. The effects of the Land Trust will be to “decommoditize” the land, and thus safeguard the newly independent farmer’s right to his property, regardless of the fluctuations of the harvest or the market. The perpetual Trust will guarantee that land cannot be repossessed by creditors in times of hardship. It will eliminate the possibility of land speculation, and absentee landlordism will be permanently avoided. Many of these concepts are based upon the development experience of the land of Israel during the past sixty to seventy years. Israel, since the beginning of its modern development, has given priority attention to questions of agricultural development, population distribution, and the prevention of absentee land ownership. The Land Trust system was pioneered by the Jewish National Fund (a non-governmental organization), and has successfully prevented the growth of a landless agrarian working class among the Jews in Israel. The concept of the Rural New Town, whereas it also has its American precedents among the covenanted communities of the earliest settlers of the Massachusetts Bay Colony, as well as among several experimental projects during the New Deal period, is largely based upon the moshav in Israel. The moshav is a somewhat modified kibbutz. It differs from the latter in that it does not eliminate all private property and in that it retains the conventional nuclear family within the home. The story of New Communities, Inc. begins with a man who was born in Albany. Georgia, attended Oberlin College, returned to help his father run a small grocery store, started his own business, and then became involved in the civil rights movement of the early 1960’s. Slater King was one of the leaders of the 1962 “Albany Movement,” when Martin Luther King brought Southern Christian Leadership Conference (SCLC) staff and workers to Albany to non-violently challenge the iron grip of legally sanctioned racial segregation in this deep southern community. From a concern with civil rights, Slater King moved to an ever increasing preoccupation with the issues of economic justice. In these efforts he was frequently joined by Charles Sherrod, the director of the Southwest Georgia Project, which is the rural counterpart of the Albany Movement, in nine adjacent counties. 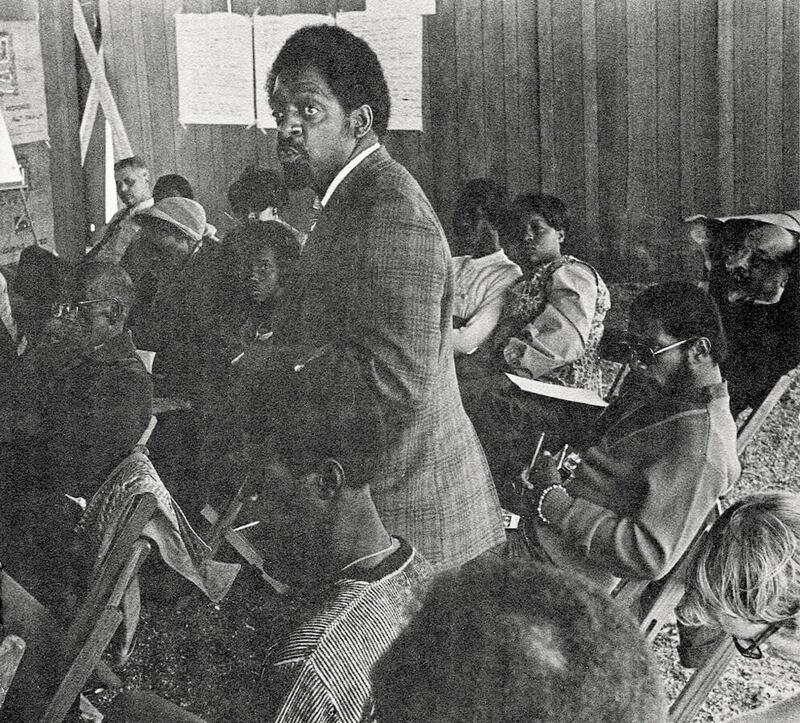 Sherrod, an ordained minister, had moved to southwest Georgia in 1960, in the early days of the Student Nonviolent Coordinating Committee (SNCC), as a rural community organizer. Under the leadership of these two men, and with the sponsorship of the International Independence Institute of Exeter, New Hampshire, and the National Sharecroppers Fund, in the summer of 1968, a small group of Black leaders from the South traveled to Israel, to learn about the solutions to problems of rural settlement that had been developed in that country. They returned, convinced that some of the ideas which had been developed in Israel could usefully be adapted to the U. S. South. New Communities was incorporated in the fall of 1968 as a nonprofit Georgia corporation. Its original board of directors included not only all those who had traveled to Israel, but also representatives of such organizations as the Federation of Southern Cooperatives, Southern Christian Leadership Conference, the Southern Rural Project, and, in an advisory capacity, the Southern Regional Council. During the past two years, this board of directors has been expanded so as to include an ever increasing number of residents of southwest Georgia, and potential citizens of the Rural New Town. Slater King was killed in a tragic automobile accident in March, 1969. But prior to his death he was able to take an option in behalf of New Communities, Inc., on a 4,800 acre farm, some 20 miles to the north of Albany. Later that year, an adjacent tract containing 927 acres was added to the original acreage. In the meantime, New Communities met with success in its application for an initial $98,000 planning grant from the Office of Economic Opportunity, under Title ID. Formal planning commenced in the fall of 1969, under the guidance of a consulting firm, John McClaughry, Associates. Architects, educators, agricultural experts, city planners and many other kinds of professionals were brought to Georgia, not so much to see the land as to consult with and to learn from the potential residents. The climax of these efforts was a “charrette,” an intensive, encounter group type of planning session held for several days on the farm, in the winter of 1970. The result was a first planning document which was submitted to OEO for further funding in the summer of 1970. During this same period, intensive community organization activity was taking place within the nine county area, seeking the ever-increasing involvement of prospective settlers in the decision making processes. The OEO planning grant had provided for a staff of six community organizers who were recruited locally. With the help of loans and financial guarantees made by national church groups, voluntary agencies, and a major charitable foundation, New Communities was able to exercise the option on the properties in January, 1970. Since that time the first several families have moved onto the land, and as of early spring, the farm has been under production. A contract for the first 102 new housing units was signed only a few weeks after the first crop of watermelons had been harvested and while a bumper crop of peanuts was being brought to market. This brief summary of the first 26 months of New Communities, Inc., has hardly touched the seemingly incessant crises of money, staff, and political opposition which a project of this nature must inevitably face. But that is the subject of a different report and of another analysis. Undoubtedly it is too early to speak in perspective. Many of the most important problems—aside from the central issue of economic survival—still lie ahead. How and by whom shall future settlers be selected? How can social innovation be nurtured, yet excessive isolationism be avoided? What shall be the political and legal relationship between the town, and the otherwise sparsely settled county? How and when can full authority for the town’s development be transferred from New Communities to the residents and their elected representatives? These and endless other problems have barely begun to arise at this early date. This is an effort to establish alternative, and relatively independent institutions to serve the poor within the context of the pervasive larger society. It constitutes an experiment in initiating social change at the grassroots, rather than at the center—the national policy level. Full and legitimate participation, not tokenism, is essential to its success. Similar to community development corporations which have arisen in many other rural and urban areas of the country, its ultimate goal is not increased welfare but rather economic and social self-sufficiency. While this first Rural New Town is predominantly, though not exclusively nor ideologically Black, it might have been otherwise. The implied criticism of a social system which permits hunger and malnutrition, in the midst of the greatest plenty that mankind has even known, is real. But the call is not for the destruction of that society, but rather for the creation within it, at first only in microcosm, of new, more just, more authentic social institutions. Mr. Gottschalk is a lecturer and doctoral candidate at the Florence Heller Graduate School for Advanced Studies in Social Welfare, Brandeis University. Mr. Swann is an architect and economist. Both are members of the International Independence Institute and are on the Board of Directors of New Communities, Inc. The pervasiveness of rural poverty, and especially farm poverty, has been documented and analyzed in numerous studies. See, for example, Rural People in the American Economy, USDA, Economic Research Service, Report No. 101 (Washington, GPO, 1965); Mollie Orshansky, “The Poor in City and Suburb,” Social Security Bulletin (December 1967). See also an interesting, but different approach to these issues from the one presented here, in Niles M. Hansen, Rural Poverty and the Urban Crisis (Bloomington: Indiana University Press, 1970). William K. Stevens, “Farm to City Migration Near End in U. S.,” The New York Times (March 23, 1969), p. 1:3. USDA admits that “for the farms with small acreage the price support and farm income support programs can usually make only a limited contribution,” White Americans in Rural Poverty, USDA, Economic Research Service, Report No. 124 (November, 1967), p. 14. For a fuller discussion of innovative planning, see, John Friedmann, “Planning as Innovation: The Chilean Case,” Journal of the American Institute of Planners XXXIT4 (July, 1966), p. 194f. The history of the covenanted community in America is elaborated by Page Smith, As a City Upon a Hill (New York: Knopf, 1966). For an example of a New Deal precedent, see Edward Banfield, Government Project (Glencoe, Free Press, 1951).